Thanks for stopping in, just have a quick question I think I know the answer to but want some verification. I am planning on making my 55g High-tech aquarium to a shrimp tank. I currently use x2 Intense Neo Solar LEDs, along with GLA Primo CO2 System. I understand from breeding shrimp that I need to keep parameters as constant as possible, whether it be temperature, GH/KH, TDS, PH, etc. CO2 sometimes can pose problems when you have them on a solenoid with a timer. SImply because alot of times your ramping up your CO2 to get to 30ppm in a short amount of time 6-8 hours, then cutting it off. I figured I would just leave my CO2 on keeping it to a low bubble count to keep my CO2 levels in the aquarium as close to 30ppm all the time. This in turn will keep my PH somewhat constant. I know the other alternative I could use is a PH controller, but at the moment I don't want to spend the $140.00 to purchase one. My question to you is, will keeping my CO2 on 24/7 pose any problems to my water parameters? I plan on keeping CRS in this 55g. Don't need CO2 or a controller if you use a buffering soil. The soil automatically drops and holds the ph constant. Soothing Shrimp, the CO2 isn't for the shrimp. it is for me keeping the aquascape I created with HC and Downoi. Oh, I see. I know a lot of people have has challenges keeping hi-tech tanks and shrimp as one display, however some have done it successfully. Perhaps one of them will chime in. Ive tried with cherries but gave up because they did not survived. Tried the way your thinking as well, ended up slowly dying. I just went to low tech after that! Someone here probably has more experience in them. I've been keeping my blue diamonds and low grade crs in my 12g tank running co2 at 1 bubble per 3 seconds. My shrimp population has exploded in this tank. I run two filters on this tanks for good flow and O2 exchange. 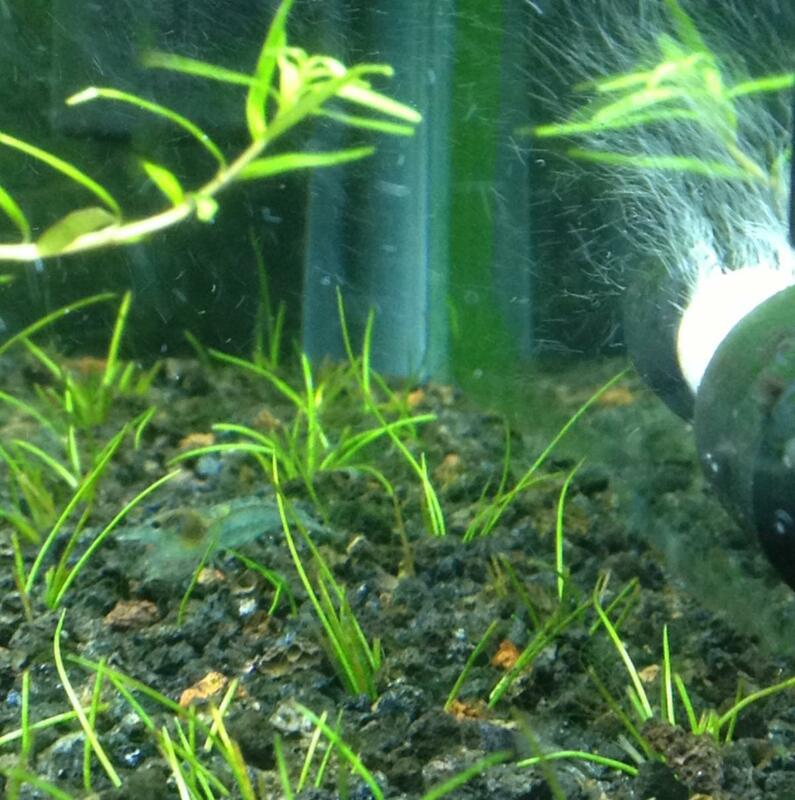 The tank is also heavily planted with lots of beneficial bacteria and good green algae growth on the rear glass. The shrimp were introduced to this tank very young. I think they have adapted well to the tank conditions. I tried keeping SSS crs in there but I don't think they could handle the conditions(ph swing). The low grade crs do not seem to be phased by it and are popping out babies left and right. It's possible to have success with co2 however I think it has a lot to do with the shrimps being able to adapt. Oh yeah... and luck! I think the failures with shrimp and CO2 have been in DIY system which you can't control the bubbles or running to much with the more advanced systems. Inverts You Keep: Just starting a colony of Cherries, some of which are displaying unique patterns I may try to breed out... But thats a bit off. I've had co2 with my cherries for a week. 3 set of 3 hours running then air pump at night. Co2 is at 1 bps, and my pH swings are enough where I think may cherries are pushed to the limits. An hour before the air stone turns on they are all on my floating plants. This is the only time they do this, and my filter inflow does break the water. In summary, I'm building another tank for shrimp based on low light and no co2 because of difficulties. To be fair though I am also have problems with GH/kh and am switching to mineralized ro water this weekend. I'm sure its possible, but much harder. Edit: I'm using pressurized co2 not diy. I'm also a noob. I have used CO2 and no longer do. You can have great planted tanks without it and does not have to be low light at all. 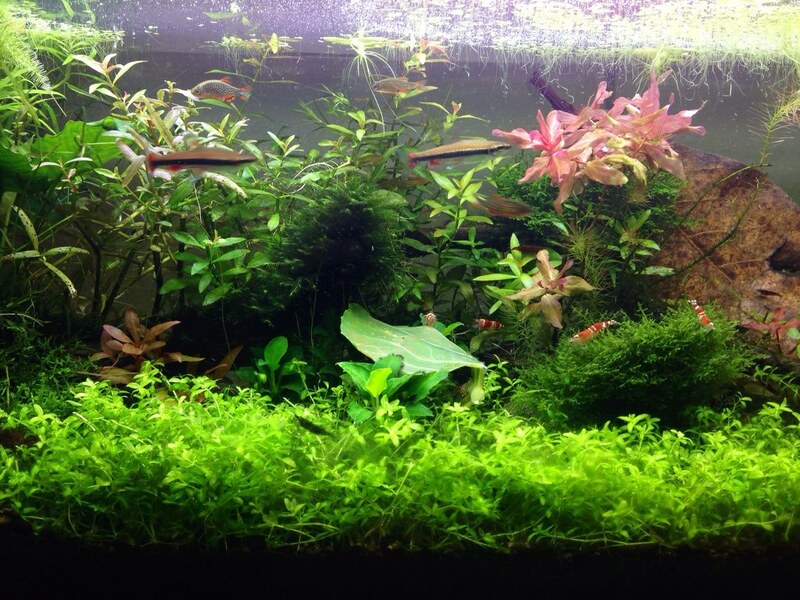 Fast growing hardy plants like vals, water sprite, ludwiga and many others take off very nicely with the correct water or even a lower light tank of just driftwood with assorted jave type mosses ,anubias and other mosses is also very pretty and once they get going they grow great. I purchased Java moss from Han think about a month ago for a 20 gallon driftwood piece and this week it is sending out roots and new plants. My biggest tank I ran co2 but when I switched it to a shrimp tank, I stopped . The plants stopped growing daily and I did lose red color in some plants but other than that after a month they all kept on growing (not as fast) . I only use regular black gravel or small river type round gravel nothing special. Weekly water changes are big with me and the plants love them. I do not use any plant additives. Very pretty tank. 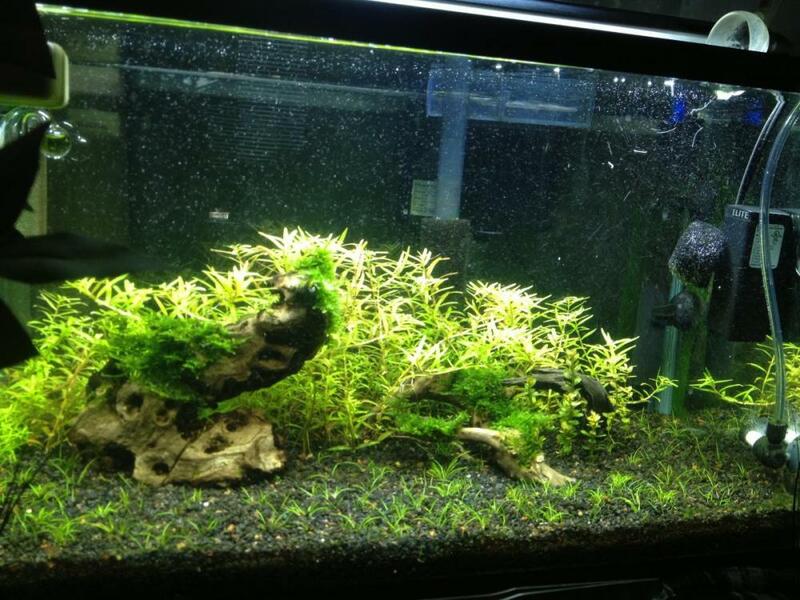 What are those plants on the bottom that carpet your substrate? I run pressurized co2 at 1-2 bps in a 10 gallon. Drop checker always in lime green almost yellow when lights are on, comes on 2 hours prior to lights and shuts off 1 hour before..
Never an issue for any creature in there..shrimp included. I also run two filters, a hob and a canister. I think the good surface movement and clean water more than make up for the co2 gas.. I actually have 3 filters with the Hagen elite mini that I use for better co2 diffusion.